If you visually surveyed a class of fifth-graders, you'd see a wide variety of body types -- some children towering over others, some lean and athletic and some with a little baby fat left in their cheeks. Although they are physically quite diverse, fifth-graders are all closing in on the rapid development associated with puberty. Therefore, it's important to offer fifth-graders solid nutrition and fitness information so that they will form healthy habits for their teenage and adult years. The MyPlate graphic, designed by the U.S. Department of Agriculture, is intended to simplify healthy eating for children and adults. The graphic shows a place setting with the plate divided into quadrants. Half the plate is filled with fruits and vegetables, a quarter with lean protein and a quarter with whole grains. To the side is a glass of milk as a reminder to have a serving of low-fat dairy. Discuss the graphic with your fifth-grader, asking him to draw an empty plate and fill it with a healthy food items. Fifth-graders have the maturity to understand some of the finer points of good nutrition. Make sure your child can list the five food groups -- fruits, vegetables, grains, protein and dairy; then discuss good choices within these groups. For instance, the USDA explains that there are five types of vegetables: dark-green, red and orange, starchy, beans and peas, and other. Ask your child to think of a vegetable for each subgroup. Another important distinction is whole-grain vs. refined grains. Explain that whole-grain foods include the entire kernel and are nutritionally superior to refined foods. 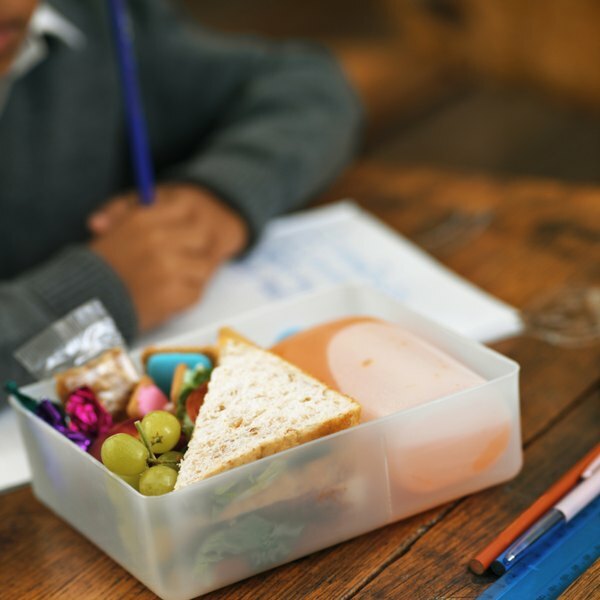 Ask your fifth-grader to list whole-grain foods such as oatmeal, brown rice and whole-wheat bread. The Centers for Disease Control and Prevention recommends a minimum of 60 minutes of physical activity per day for children. Three times per week, children should perform some strength-training activity -- such as gymnastics or push-ups -- and bone-strengthening activity -- jumping rope or running -- in their 60 minutes of exercise. At first glance, the CDC's guidelines seem strenuous. Keep in mind that any activity counts, including school recess and physical education classes. In fifth grade, children are already starting to feel peer and media pressure to look a certain way. If you're not careful, your child may hear you talk about fitness and nutrition and take it as a not-so-subtle hint to slim down. While nutrition and fitness education is important, the best way to teach health to fifth-graders is to model good habits. Involve your child in the kitchen so he can take pride in making healthy food. Take time to go to the park as a family or play a game of catch with your fifth-grader after work. Show your child that healthy food is fuel for a fun and active lifestyle.